Whilst browsing the internet last night I came across this very interesting piece of craft – “The Granny Pendant Light”. It was developed by Pudelskern Design and is made from thick woollen threads. 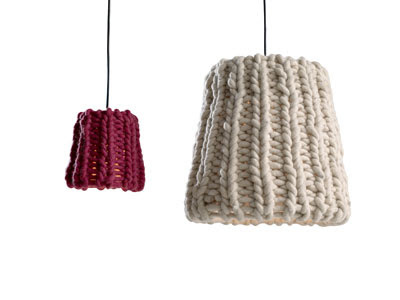 Each lamp is hand knitted by craft workers in Holland. To increase its natural flame retardant properties, the wool is treated by a process which also eliminates the possibility of moth or insect infestation. It looks pretty cool to me! Time to replace those chandeliers everyone! The post Knitted Lampshades appeared first on Tea and Crafting.